Texans Coach Bill O'Brien talks about the starting quarterback situation. HOUSTON (KTRK) -- Alex Smith and the Kansas City Chiefs were so good before halftime that they didn't need to score after the break to beat the Houston Texans. Smith threw for 243 yards and three touchdowns in the first half as the Chiefs built a big lead and held on for a 27-20 victory over the mistake-prone Texans on Sunday. Travis Kelce caught two touchdown passes in the first quarter, the first one coming after Kansas City intercepted Brian Hoyer's first pass as a Texan. 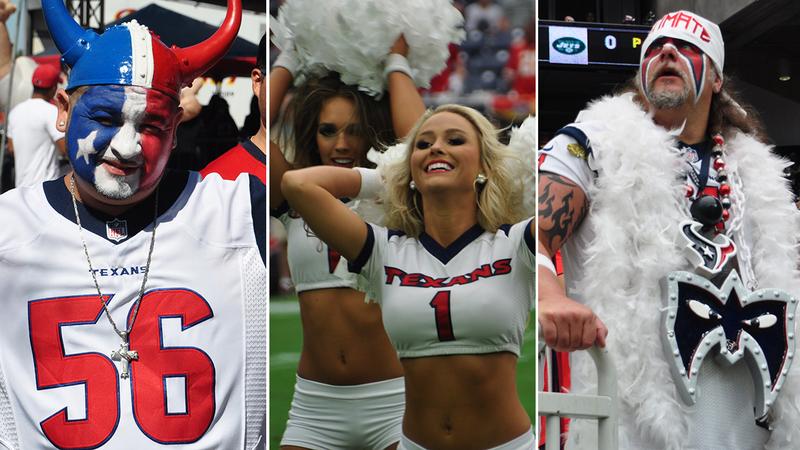 See fans, cheerleaders and players before the Texans home opener against Kansas City. J.J. Watt had two sacks and nine tackles, including six for losses. Jadeveon Clowney, last year's top overall pick, had four tackles, with one for a loss, in his first game since microfracture surgery in December. He didn't start but came in on the second play and played mostly on third downs after the first series. The Chiefs had five sacks, with Allen Bailey leading the group with two. DeAndre Hopkins had nine receptions for 98 yards and two touchdowns in Houston's first game without star receiver Andre Johnson, who was released in the offseason. Hoyer, who started 13 games for Cleveland last season, elicited boos throughout the afternoon, and the home crowd began chanting "Mallett! Mallett!" after Hoyer was called for intentional grounding in the fourth quarter. He was 18 of 34 for 236 yards. 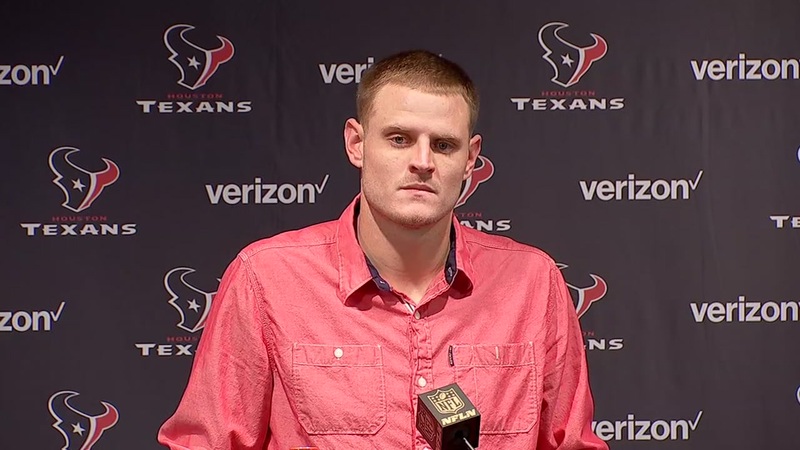 Mallett was eight of 13 for 98 yards. Hoyer's pass was intercepted by rookie Marcus Peters on Houston's first drive, giving the Chiefs the ball at the Houston 13. Smith connected with Kelce two plays later on a 10-yard touchdown pass to put Kansas City up 7-0. Kelce pushed the lead to 14-0 when Smith found him wide open on a 42-yard touchdown pass. Kelce rolled his left arm in a windmill motion on the last few steps to the end zone before punching the ball out of his hand after crossing the goal line. Kelce finished with 106 yards receiving. The Texans finally got going after that, with Hopkins reaching over a defender to grab a 4-yard touchdown pass late in the first quarter. But Randy Bullock missed the first extra point of his career and the first since the NFL moved extra point attempts from the 2-yard line to the 15, to leave Houston down 14-6. He had made all 66 of his previous attempts. Watt's first sack came midway through the second quarter when Jah Reid knocked his helmet off trying to slow him down. Watt got to Smith anyway, taking him down for a 9-yard loss without his helmet. Reid was given a penalty for illegal use of hands on the play. Kansas City's second field goal of that quarter came two plays later to extend the lead to 20-6. Houston's strip sack of Hoyer came on the Texans' next possession and the Chiefs recovered it at the Houston 7. The Chiefs cashed in on the mistake one play later on the touchdown by Charles. A 34-yard field goal by Houston just before halftime cut the lead to 27-9. Another sack by Watt, last year's Defensive Player of the Year, came with an assist by Clowney in the third quarter. Clowney got into the backfield, flushing Smith from the pocket and Watt dragged him down as he tried to evade Clowney. Hopkins grabbed an 8-yard touchdown pass from Mallett in the fourth quarter and also caught a pass for the 2-point conversion. A 47-yard field goal by Bullock with less than two minutes remaining got Houston within 27-20. NOTES: Kansas City safety Eric Berry had two tackles in his first regular-season game since revealing he had lymphoma last November. Berry was declared cancer-free in June and cleared to practice just before camp. ... WR Jeremy Maclin had 52 yards receiving in his debut for the Chiefs after spending the first five years of his career with the Eagles.